I have been a real estate agent for 7 years - 3 years as a sales associate and then earning my Broker license in 2006. I have served & chaired various committees through out the years with the 100 + member Searcy Board of Realtors®, serving as Vice President in 2006 and as 2007 President. Prior to entering the Real Estate field, I worked as a Respiratory Therapist for over 25 years having served as the Director of Respiratory Care at both of the Searcy hospitals and at St. Vincent Hospital in Little Rock. In addition to serving on the Searcy Board of Realtors®, I also serve on the Board of Directors, and was a founding member of the Christian Health Ministry of White County in Searcy. CHM is a free medical clinic serving the physical, emotional and spiritual needs of the uninsured of White County. Currently I am serving on the local Board of Directors for CASA. - Court Appointed Special Advocates. whose mission is to support and promote court-appointed volunteer advocacy for abused and neglected children so that they can thrive in safe, permanent homes. 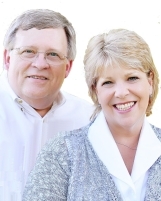 My husband, David and I, attend the Downtown Church of Christ, where we teach in the 2 year old class and served on the Children�s Ministry steering committee. I also served as a �Mentor Mom� for the Searcy Chapter of MOPS � Mothers of Preschoolers. In my spare time, I enjoy home remodeling and landscaping as a hobby. So I keep myself up-to-date and on top of the latest trends and am able to give suggestions and advice from my own �hands-on �experiences. It would be my pleasure to help you with any or all of your real estate needs. Please feel free to call or e-mail me with anything that I might be able to help you with. May God bless you with your future plans. After working in my family's business, Merritt Equipment Company, a farm & construction equipment business in Searcy, for over 30 years as the Parts Department Manager and Information Technology manager, in January 2006, we decided that I would begin helping my wife Kathi in her growing and expanding Real Estate business. After receiving my Arkansas Real Estate license in February 2006, we formed TEAM-MERRITT. In 2006 and every year since, we achieved the Arkansas REALTORS® Association - Diamond Award, the highest level award possible, in the Arkansas Realtor® Association, Awards of Excellence recognition program. Understanding the value to our clients of additional education & training, in the fall of 2006, I earned the ABR® - Accredited Buyers Representative and the e-PRO® designation. Then in 2007 I earned both the GRI® - Graduate of REALTOR Institute designation and the CRS® - Certified Residential Specialist designation. In 2009 I earned the SRES® - Seniors Real Estate Specialist Designation and in response to the growing foreclosure market, I earned the CDPE® - Certified Distressed Property Expert designation. What do all those letters after the names mean? CRS, GRI, ABR, SRES, CDPE, e-PRO ? ABR® is an association of real estate professionals focusing specifically on representing the unique and special needs of the real estate buyer. Of the over 1 million Realtors®, there are only 32,000 agents that have earned the ABR® designation. To earn the designation, agents must complete classroom training on various subjects pertaining to the exclusive representation of the real estate buyer client, receive passing grades on final tests and achieve an advanced level of sales performance. GRI® is the mark of a real estate professional who has made the commitment to provide a high level of professional services by securing a strong educational foundation. In order to earn the "Graduate REALTOR® Institute� (GRI) designation, the agent must attend and complete a specific, intensive series of a minimum of 90 hours of classroom instruction, covering a variety of subjects including: contract law, professional standards, sales and marketing, finance, and risk reduction. By earning the SRES® designation, your REALTOR® has demonstrated necessary knowledge and expertise to counsel clients age 50-plus through major financial and lifestyle transitions involved in relocating, refinancing, or selling the family home. Your REALTOR® has received special training, gets regular updates, and is prepared to offer the options and information needed in making life changing decisions. A Certified Distressed Property Expert® (CDPE) is a real estate professional with specific understanding of the complex issues confronting the real estate industry. Through comprehensive training and experience, CDPEs are able to provide solutions for homeowners facing hardships in today�s market. The prospect of foreclosure can be financially and emotionally devastating, and often homeowners proceed without guidance of any kind. The developers of the CDPE Designation believe that in almost all cases, the best course of action for a homeowner in distress is to speak with a well-informed, licensed real estate professional. They have the tools needed to help homeowners find the best solution for their situation. While enduring financial difficulties is challenging for any family, the process of finding a qualified real estate professional should not be. Selecting an agent with the CDPE Designation ensures you are dealing with a professional trained to address your specific needs. For more information, contact a CDPE in your area. CDPEs don�t merely assist in selling properties, they serve and help save their clients in need.